Let us plan your next Charter abroad in pure luxury on one of our Private Yachts in the beautiful Italian Coast line . We can take care of every detail for you from the Yacht to all travel arrangements and transports. The 10 Most Beautiful Italian Coastal Towns and Cities according to Culture Magazine " Italy boasts a wealth of postcard-perfect coastal towns, each with its own panorama of breathtaking ocean views. The towns are easy on the eye from sea-level too, with rows of colored houses blanketing the dramatic cliff-faces. We list 10 of the most gorgeous Italian coastal towns and cities to spark romance in your soul." Part of the Cinque Terre National Park (comprised of five villages) in Liguria, Manarola is reputed to be the most colorful city in the world. Famed for its Manarolese-speaking locals, the town resembles an artist’s palette; vibrant buildings jostle each other for space. Every year, visitors flock to hike between these five towns and numbers soar in peak season. Don’t miss a visit to the Church of San Lorenzo, beautiful both inside and out, with sweeping views of Manarola and neighboring towns. Positano is widely regarded as the most picturesque and photogenic town in Italy, with its rustic charm and wisteria-draped hotels. The most sophisticated resort on the central Amalfi Coast, it is also the most expensive. Positano’s enviable location allows visitors to travel by boat to nearby Capri, Ischia and the Grotta dello Smeraldo. You can also choose to spend a day on the Spiaggia del Fornillo beach, a smaller, more easy-going alternative to the popular Spiaggia Grande. Located where the mountain meets the sea, and where citrus plantations alternate with deep valleys; Sorrento is set in an extraordinary landscape. Set within the province of Naples, the civilized old town is known for its production of lace and ceramics. Sip a glass of Falanghina and soak up the atmosphere in Piazza Tasso square, a people-watcher’s paradise. The beauty of the town makes up for its lack of beach with its prime location; Amalfi Coast to the north, rolling countryside to the east and stunning Capri just offshore. Portofino and its distinctive half-moon harbor is located on the coast of Liguria, in the province of Genoa on the Italian Riviera. Having become increasingly upmarket in recent years, it’s popular with the rich and famous, and you’ll now see luxurious super-yachts generally present on the horizon here. Hike up to Castello Brown, Portofino’s 15th-century castle, for spectacular views. In the province of Bari, Southern Italy, Polignano a Mare is perched upon limestone cliffs overlooking the azure sea. The historic old town is thought to be one of the most important ancient settlements in Puglia, and features a maze of houses and narrow alleyways, as well as many panoramic terraces offering views of the Adriatic Sea. Along with its rich history, Polignano is known for being home to world-class cliff diving, and has previously hosted the Red Bull diving competition. Riomaggiore is part of the Cinque Terre, and is the largest and most easterly of the five villages. Sitting upon the unspoilt, serene blue waters of the Gulf of Genoa, Riomaggiore is famed for its Sciacchetra sweet wine, made by Bosco, Fermentino and Albarola grapes. Riomaggiore’s multi-colored ravine of peeling pastel buildings is where the famous Sentiero Azzurro (Blue Path) begins. 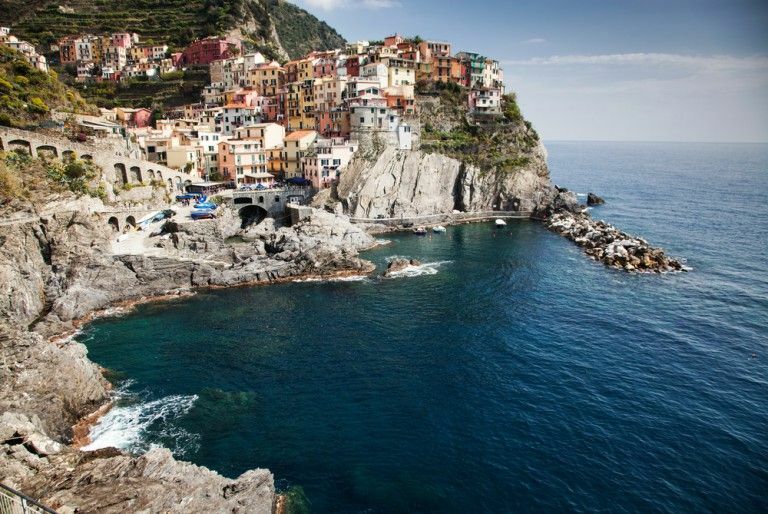 From here you can embark on the first section between Riomaggiore and Manarola, which is also known as Via Dell’Amore (Lovers’ Path). Amalfi lies at the mouth of a deep ravine, at the foot of Monte Cerreto within the province of Salerno. Surrounded by dramatic cliffs and coastal scenery, Amalfi is modestly sized, and visitors can walk from one edge of the town to the other in 20 minutes. The town boasts sun-filled piazzas and small beaches; its many squares are connected by pedestrian streets flanked with souvenir shops, perfect for stocking up on cameo brooches and limoncello. Also don’t miss a visit to the Duomo di Sant’Andrea Apostolo, the 9th-century Roman Catholic structure. Ascend the steps and admire the beautiful mosaics and magnificent ceiling detail. Located just around the headland from Amalfi, Atrani became the wealthy residence of Amalfi’s most powerful families. Today, Atrani maintains a distinct fisherman’s town atmosphere. Traditional houses climb up the valley from the beach, broken up by lemon terraces and colorful gardens; an atmospheric tangle of tightly packed buildings and narrow staircases. As the smallest town in Southern Italy, Atrani’s ancient medieval structure remains incredibly intact. Santa Cesarea Terme sits atop a rugged plateau overlooking the sea in Puglia, on the “heel” of Southern Italy. The town is characterized by the typical architecture of the early 20th century, and its coast is punctuated with thermal springs, situated within four natural caves along the cliff face. Although not as touristy as other Italian coastal towns, Santa Cesarea Terme’s popularity with Italians themselves makes it all the more authentic. A pathway through the woods leads to the higher side of the town, which boasts beautiful views of the Salento coast, all the way up to the headland of Santa Maria di Leuca. As the capital of the Italian island Sardinia, Cagliari’s Sardinian name Casteddu translates into “Castle”. To get the best view of its golden-hued palazzi and domes dominating the horizon, make sure you arrive in Cagliari by sea. Cagliari boasts the best of both worlds; a rich history and a town peppered with Roman ruins, along with the lively and youthful atmosphere of stylish Poetto Beach.